Here’s a guy who’s won Le Mans as well as season titles in Grand Am and the Weathertech Sports Car Championship asking to have a velcro shoe autographed on TV. It’s a brilliant gag. Fox Sports’ presenters are clearly into it, jokingly [update: or not!] asking for security to step in (but not really). Sorry, Jordan. You’ve now officially been one-upped by, um, yourself, I guess. 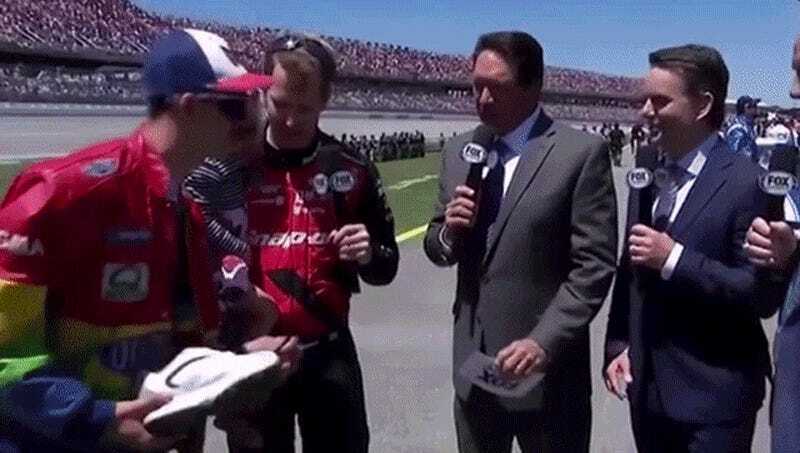 Rodney’s the famous one now, getting recognized by retired NASCAR racer and one-time Wayne Taylor Racing teammate Jeff Gordon and everything. Clearly, retro car fest Radwood needs a Florida swing so Rodney can steal one of his alter-ego’s cars and shred some burnouts. Rodney’s wardrobe is on point, and we’re pretty sure he’d get there fast. UPDATE [5:42 p.m.]: Turns out, Darrell Waltrip’s call for security was actually genuine!